I really enjoyed working with my friend Emma on this beautiful woodland wedding. I really love this theme and keeping the flowers simple really works. 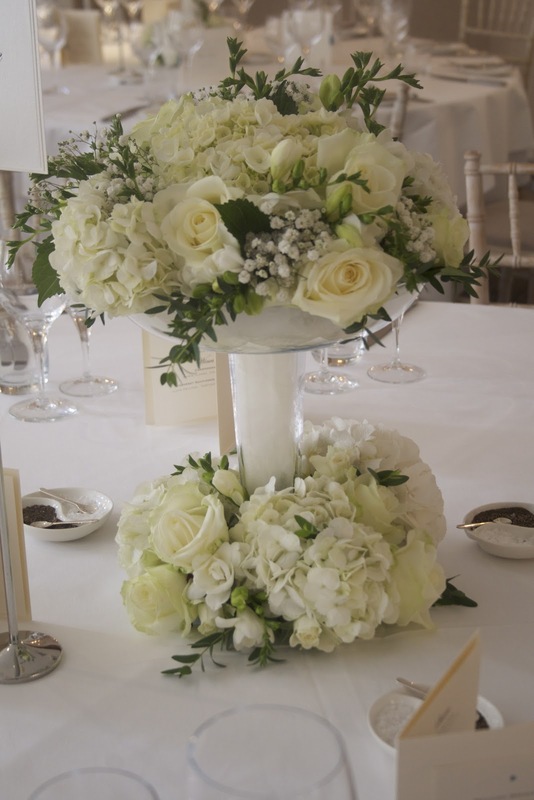 In the reception using 2 different arrangements on alternative tables looks great. 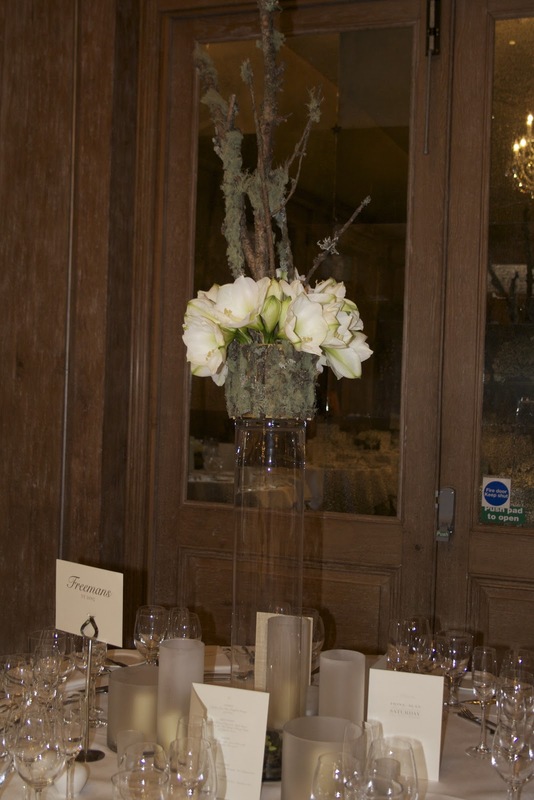 One table being low and the other table high on top of glass column vases. This was the low arrangement and consists of 9 Amaryllis in a willow wreath. These were in wooded circular vases. The ceremony room looked stunning with our trees with orchid trails and hanging T-Lights. The cake was even set on a woodland stage! I can't believe how lucky my brides have been with the weather recently. On the morning of Jenny's special day, it rained and rained but whilst delivering the flowers the sun started to crack through and some blue skies appeared! For the really important moments the weather held. 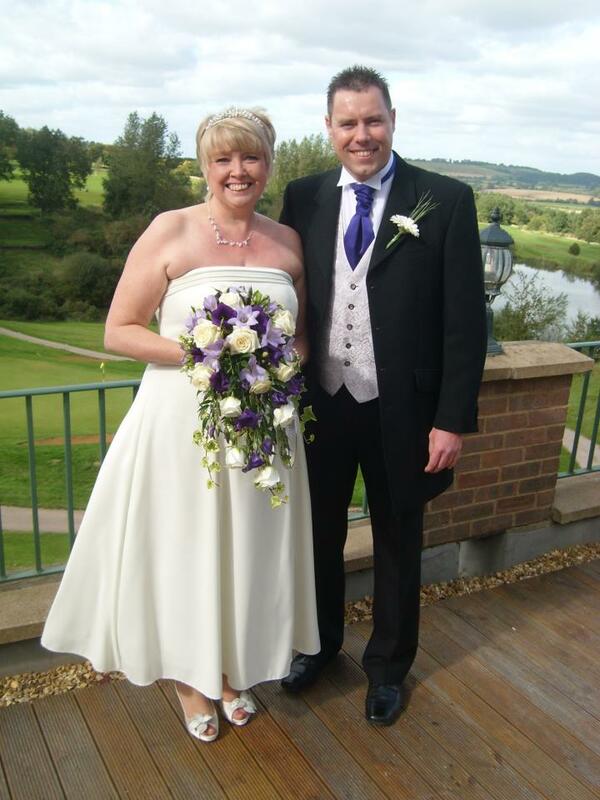 Congratulations to Jenny and Simon. These flowers were tones of purples with a hint of orange. 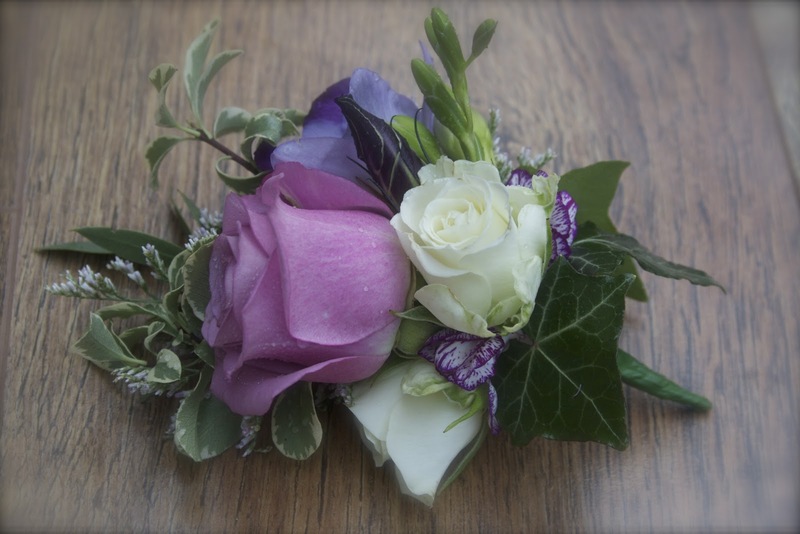 We used Cool water and Avalanche Roses, Purple & Lilac Eustoma, and Freesia. We used Eucalyptus foliage. These corsage was for Jenny's mum. The feel of Autumn has arrived and so this weekends wedding had reflected that so well. Bouquets of red and cream roses with berries and ivy were the order of the day. 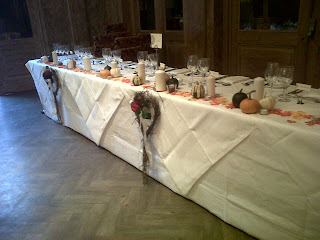 The bride and groom arranged there own table setting which featured lots of mini pumpkins and Gourds. Although it was a cold start to the day( first time i have had to scrape ice off the car) , the sky was blue was for them. Hope it was all they dreamed of. 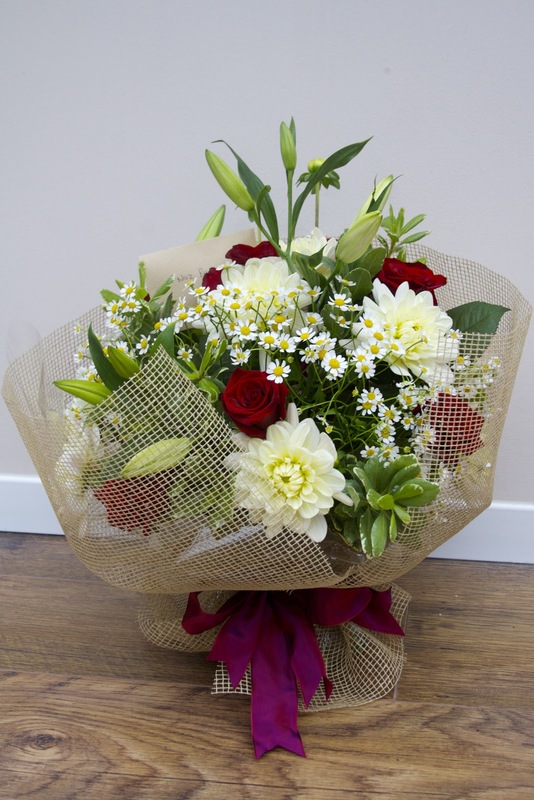 Remembering a loved one and sending some flowers is the perfect way to remind some one of how special they are to you. 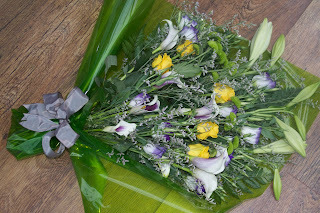 Been busy getting several bouquets ready for delivery. If you can, always tell your florist the persons favourite flower or colour if you cant remember. That way your loved one will feel very appreciated! 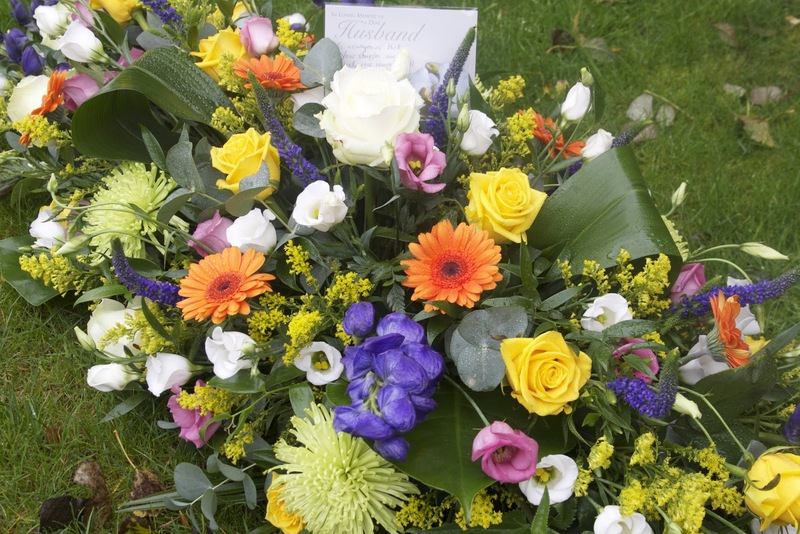 A single ended spray makes a beautiful personal tribute for a loved one. This one consists of Pink Roses, Pink Eustoma, Purple Veronica and two toned Carnations. This tribute cost £35. Had a really busy time meeting brides and putting together quotes for 2013. Please get in touch if you'd like a price for wedding flowers. Getting ready for some funeral work on Monday. Have lots of full buckets of flowers. A great feeling but not as great as emptying them on Monday as the work gets under way! Will post pictures early next week. Time for a cup of tea now and to enjoy the rest of the weekend. Just delivered a bouquet to a shop in the town centre. The young sales assistant blushed when she realised the flowers were for her. Young love is so sweet and how that makes a girls day! Being remembered and appreciated is priceless! Had a really busy few days and went to an amazing venue in the Cotswold. I was working with my friend (a fantastic wedding florist) Emma. We did lots of exciting floral work and it all looked amazing! The colour palette was simple in elegant creams and we used lots of Avalanche roses and Hydrangea alongside freesias and gypsophilia. The hotel was Lord of the Manor. Check it out for an intimate wedding venue and the church near by was used by Noel Edmonds when he got married.